Recent movies including Terrence Malick’s “The Tree of Life” and Richard Linklater’s “Boyhood” have drawn praise for the combination of poetry and realism in their depiction of young males growing up in small-town environments. Such films now have an extraordinary nonfiction equal in “Rich Hill,” a powerful, engrossing look at the lives of three teenage boys coming of age in the eponymous Missouri town of the title, population 1,393. Produced and directed by first cousins Tracy Droz Tragos and Andrew Droz Palermo, the film joins a long line of cinema verite explorations of American families. Yet the focus here is on families whose low place on the socioeconomic ladder entails problems—addiction, domestic violence, child abuse, prison—that many more fortunate Americans, including the presumed audience for most documentaries, seldom have to face. Though that may make “Rich Hill” sound like an “issues film,” it is anything but. Or rather, while there are many issues into which the film offers abundant insight, including poverty and the all but inescapable trap it becomes for many families, it is also about so many other things, including the rituals and rhythms of small-town life and the complexities of individual personalities. It emerges as an artistic statement as multi-faceted, nuanced and hauntingly original as any of its fictional counterparts. One of the first things that deserve to be noted about “Rich Hill”—and that may make it controversial in some quarters—is its beauty. Any description of the film that only describes its people and events would largely miss what it feels like to experience it. From its first moments, when several jump-cut shots of a teenage boy getting ready for school give way to lyrical views of Rich Hill as it comes to life in the morning, the combination of editing rhythms, Nathan Halpern’s music and Palermo’s strikingly luminous images conjure a world that seems to pulse with its own inner warmth and radiance. Yet any charge that this approach inappropriately prettifies a bleak social landscape would be entirely misplaced. The filmmakers are both native Missourians (Dragos’ father was from Rich Hill and she spent summers there), and the film’s stylistic tone first of all reflects their feelings about a native landscape and communities they know first hand. And, rather than simply being a surface value, it helps establish an empathy that invites us to see not only the hardship but the beauty in lives that are buffeted by difficulty from many directions. 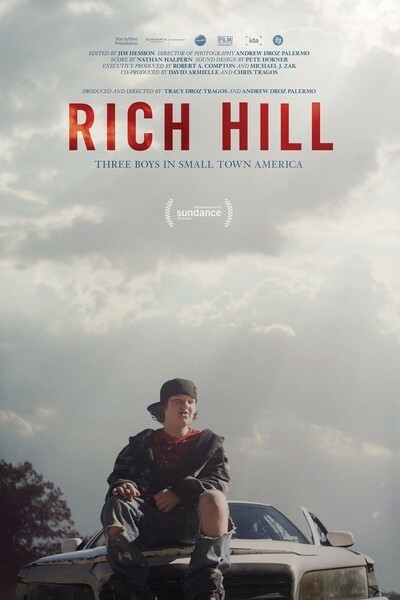 For if adolescence is inherently a time of difficulties, the three boys at the center of “Rich Hill” have more than their share. Harley, who’s 15 and wears a black t-shirt labeled “Horror Movie,” lives with his grandmother since his mom, a waitress, is in prison for assaulting his step-dad (because, the boy says, the man raped him). An avid collector of knives, Harley’s on medication for numerous conditions and constantly seems near a flash point of rage, which partly explains his trouble in school. Yet he also has an irrepressible sense of humor that seems to counteract his anger. Appachey, 13 years old and also on medication for various disorders, lives in the most disorderly home, a trash-cluttered house where his obese single mother rides herd over a swarm of kids. He recalls, “My dad left when I was six, just walked out.” Bright but troubled and prone to outbursts, he’s obliged to repeat sixth grade and has other problems at school that seem to point toward the juvenile detention system. His hard-nosed mom says she can’t control him and he’ll have to decide to get help himself. Fourteen-year-old Andrew, meanwhile, differs from the other two boys in notable ways. Strikingly good-looking and sweet-natured (his mother calls him her angel), he has a stable, loving family, takes no meds and seems to like school. But his family’s poverty makes for a highly unstable existence. While his mother’s housebound due to illness, his dad is one of those archetypal luckless dreamers who schemes of making money as a singer, inventor or prospector but meanwhile works odd jobs that don’t end up making ends meet. Unable to pay rent, his family moves and moves again, and late in the film ends up bunking with cousins who themselves are in hard straits. Brilliantly edited by Jim Hession, the film deftly interweaves the three families’ stories as they unfold over many months (the three boys never cross paths). By all indications, the filmmakers achieved a remarkable degree of trust and closeness with their subjects, because the film’s intimacy feels entirely natural and unforced. And beyond the individuals and their families, “Rich Hill” captures a sense of life in contemporary small towns that’s textured and evocative enough to recall the fictions of Thornton Wilder and Sherwood Anderson. This is especially true when it comes to community events like fairs and football games. And at the town’s annual Fourth of July celebrations, the thematic motif of luminescence in Palermo’s filming reaches a visual crescendo. It’s as if all the lights in the lives of this community unite in an outward explosion of joy, affirmation and hope. Yet such exultation is, of course, only one part of a much more complex and often disturbing picture. The most salient virtue of “Rich Hill” is how carefully phrased its sympathetic portrayals of its main characters are. We cannot help but be drawn to all three boys and moved by their struggles and their families’ travails. Yet this leaves us in a paradoxical position. On the one hand, we can see the pluck and resilience of Harley, Apachee and Andrew to the extent of imagining that these qualities and their individual talents might rescue them from bad later lives. Yet, coming at a time when the dire effects of America’s economic inequality are more and more in the news, we’re given potent reminders of how limited and bleak the chances of such kids usually are.